Few in the west are aware of the civilizations and cultures of SE Asia that may be considered ancient. In China there are many minority cultures contemporary with the recognized Chinese eras of the Shang, Zhou, Warring States, Chin and Han Dynasties. The most artistically renowned ones are in the Southern provinces of Sichuan and Yunnan Provinces, the Qiang, Ba, Shu and Dian Cultures which influenced the Vietnamese Dong Son Culture. I have ancient swords and other weapons from all of these areas and I own a website for the discussion of Dong Son at http://groups.yahoo.com/group/Dong_Son/ If you go to the Photos archive you will see pictures of my collection, including a sword from the later Champa culture of Central Vietnam. Please join and follow the occasional discussions if you are interested in this area. Ancient Thailand had a complex Bronze Age Civilization that arose independently from all other areas, generally called the Ban Chiang area of Northwest Thailand. Please go to http://groups.yahoo.com/group/Ancient_Thailand/?yguid=30974666 I have included photos of Khmer items from Cambodia as well although these items are of a much later era. All the photos are duplicated at http://groups.yahoo.com/group/ancientweapons on which I have posted all of the photos from the above groups as will as many Near Eastern weapons. You will note from my postings that I believe in research to confirm weapons identifications with my own references, I have found over the years that dealers in swords and other weapons should not be trusted in the descriptions given, I have made some tremendous buys of very rare items on eBay because the sellers had no idea of what they were selling, using the faulty descriptions given to them by their suppliers. 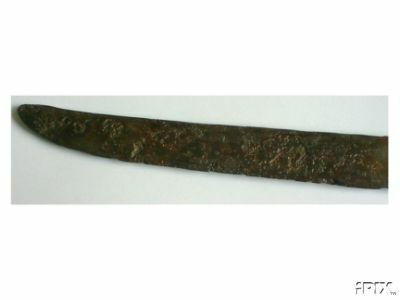 Many items are identified as Roman that are really Iron Age Celtic LaTene items which are much more common because such a description will lead to higher auction prices. Cheap Chinese repros and fantasies are often offered for sale that are worth less than $10. 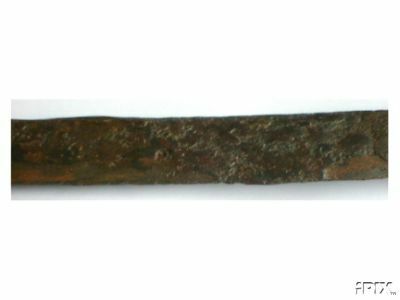 as Near East and European Bronze Age weapons, if you are interested in such repros, search Swords on eBay and click the Lowest Price option. You will see literally thousands of them. I should point out that many ancient and antique swords and other weapons can be purchased for prices cheaper than some modern repros and fantasies. If you are interested in repros of historical swords, I would suggest a search first to discover what genuine ones of the style you are looking for are available before making a decision. You might decide to purchase the genuine sword rather than the repro. Thank you, John. Interesting information. Any chance you'd be willing to post some photos here? I can't view the Yahoo pix, as I'd have to join. Additionally, I've found it much easier and valuable to have the item being discussed posted in the thread. Do any of your Dong Son swords look like this? "I gave 'em a sword. And they stuck it in, and they twisted it with relish. And I guess if I had been in their position, I'd have done the same thing." 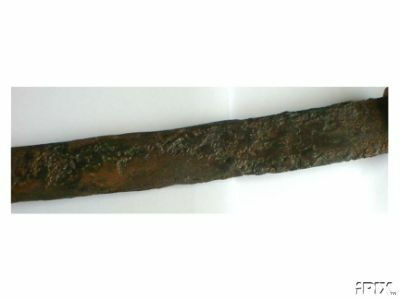 No, everything I have seen from the Dong Son and Dian areas has been made of bronze, your sword looks more like a Dha which may belong to the Khmer, Thai or Burmese areas. The hilt looks like polished brass with an iron blade, that would lead me to discount Khmer. I would suggest that it would date to the 17th C. or later. The brass hilt would have been cast onto the iron blade. I only have one bronze sword that is Dong Son, several Khmer swords. 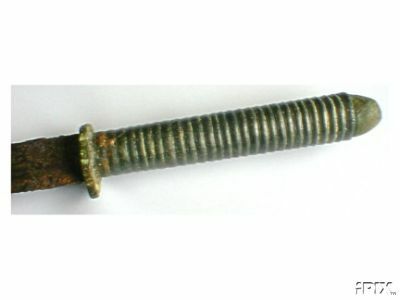 Beware, I purchased a supposed Thai Sukothai sword that turned out to be a British Enfield bayonet with a cast on bronze hilt and left to rust. If you are interested in purchasing ancient weapons from the Dong Son area, the Red River Valley from Haiphong to Yunnan in China, I would recommend that you contact Mikkel Pedersen in Copenhagen Denmark. He has one listing for a Dong Son weapon on eBay now: http://cgi.ebay.com/ws/eBayISAPI.dll?ViewItem...3701163379 I have several smaller dagger size pieces in this style. Why do you object to signing up for the Yahoo Groups? All you have to do is complete a profile and you can join good historical groups that interest you. I own Dong Son, Thailand, Kushan and Chinese Archaeology Groups and moderate Ancient Weapons and coin (AFST) groups and I am a member of dozens of others. Try joining my http://groups.yahoo.com/group/ancientweapons and take a look at the Photo archives. I have posted hundreds of pictures of my collection. Unlike SFI, you can attach multiple pictures in the same post to make things easier to view. Also, linking in photos from outside sources works just like on SFI. I should point out that I do not own the above sword, it was offered to me as Champa and thus it is defined. I have no books that show this but I suspect that it is from the Khmer Kingdom. When it was offered to me I did not have sufficient funds to make the purchase. 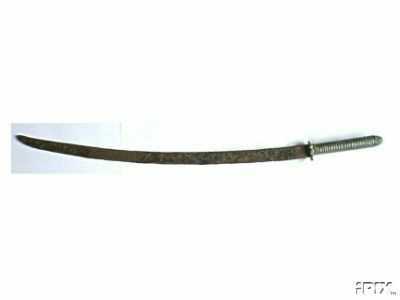 The sword below is absolutely from the Champa Kingdom, it was purchased by a Thai dealer for me in the old Vietnamese capital of Hue where it was found locally. I am posting two pictures that are a bit out of date to show you what Dong Son Weapons look like. If you have any questions on any specific piece, please contact me directly at jpisc98357@aol.com. The bottom picture above is actually the top of my Dong Son display board and shows my single bronze Dong Son sword. As you might guess, the top picture is actually showing the bottom half of my display. If anyone is interested, the hilts at the bottom of the picture are of Swedish swords. You will note, if you look carefully, my dagger example of what Mikkel Pedersen is offering in the link I posted above, see the slotted hilt. I purchased most of these items from Mikkel. 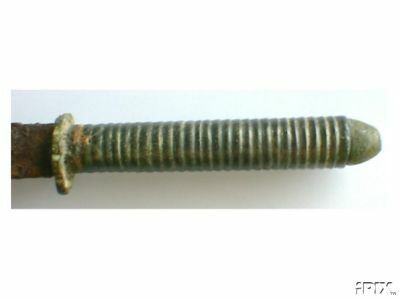 They are relatively inexpensive when compared to European Bronze Age weapons. Any idea on the age of the Cham sword? Champa was around for nearly 1000 years, and doubtless its weapons went through many phases. Cham art, like art from elsewhere in SEAsia, doesn't provide much definitive information beyond the last couple centuries, by which time of course the Cham kindgom had been conquered by Vietnam and its people dispersed to the mountains or to Hainan, where they are today. anything purchased on the commercial market will be orphans until someone in Vietnam does an in depth study of excavated weapons that will enable stratigraphic and epigraphic dating. I have books on the more ancient cultures but nothing on the Champa and Khmer or Thai Kingdoms that reigned from 500 AD to the coming of the European powers. The Mongols came by sea and conquered the Champas in the 13th Century, I would date anything Champa before that date as a rule but would always say that the conquest of the capital would not mean that the whole countryside disappeared from the Champa map. Pockets of technology would have persisted even after the conquest by the Vietnamese. Outstanding information! Thank you, particularly for the photos. Some of this I've not come across before, and has given me much to think about. The photo I've posted is of a sword in the Met's collection. They have it identified as Dong Son. I strongly doubt that. Ironically, I just posted this in a related thread about a purported "Khmer" sword on SFI's General Forum (http://forums.swordforum.com/showthread.php?s=&threadid=30309). "Here's a photo of it, along with a "Montagnard" style dha from my personal collection. The similarities in form, dimension and proportion are, to me, striking. My sword is no more than 100 years old. I have no objection to registering on Yahoo. It's just that, for me, reading and responding on this thread is easier and more meaningful with the pix posted right in the thread. The Metropolitan Museum of Art in New York City blew their identification big time on this Dha. Apparantly their expert in this area accepted a story given to him by the Donor of the sword, not a good practice. I always regard such swords in my collection as "orphans" until I am able to properly document them with a literature reference. He has a number of nice ancient weapons which include some nice write ups. I do not think that his description of an Iranian antenna sword is accurate, I researched the item last year and could find nothing similar in my Iranian books. He has some nice Dong Son daggers and spearheads for sale. Hi John. I agree with your asessment of the Met's misidentification of that sword. I've handled too many substantially identical weapons dating no earlier than the 19th century to come to any other conclusion. It's patently incredible that a 2000 year old form would survive so unchanged. I've seen those Dong Son daggers (the ones with the basket-like pommels) many times over the years. While I beleive them to be based on a genuine, excavated example, I'm very concerned as to authenticity of those that appear on eBay. There have been so many that, if genuine, it makes one think such artifacts are being found in every rice paddy in Vietnam. Having said that, I have no experience with the particular seller you've mentioned, so I have no comment about the weapon(s) he's offering. What's your opinion on that?